Is saving more money one of your 2018 goals? This is always one of my goals but it is easier said than done right? 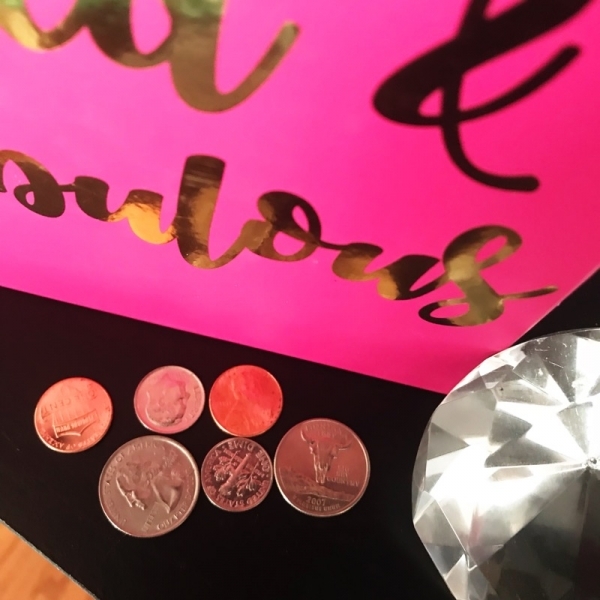 Well, I wanted to share with you a simple and fun savings strategy that I incorporated in 2017 and I LOVE IT. I’m one of those ladies that will carry a 8lb purse and when I pull out everything in it, most of the weight came from the change at the bottom. I know, I know, that’s sad. One of those sad days, I wanted to see just how much change I would keep in my purses so I went through my closet and checked all of my clutches and handbags. To my surprise, they were all chocked full of change. I found a small plastic storage bin and dumped all of the change into it and added more change to it for about a month or so. Fast forward to the Summer and my husband and I wanted to take our daughters to Disney World. I told them that I would let them cash in all of my change so that they can use at the parks. Ready for this? There was almost $400 in that storage bin!!!!!!!! $400 in change, coins, little metal pieces! From that point forward, I never took the “coin” for granted. Just think about the times, you may complain about not having the extra money to do small projects around your home, sign up for a class or workshop, go to the spa, or plan a staycation. You just may have the funds you need laying around in your purse, couch, or car. I jazzed this plain jar up by using two strips of scrapbook paper and secured the strips with double sided tape. I love to embellish so this jar didn’t stand a chance. It is super easy to use and doesn’t take up a lot of space. This is the official home for all of my change. This is also something that your entire family can take part in to save up their own “fun” funds. This coin bank also serves as another visual for me to see that money is always being collected and if I keep at it, I’ll have some “fun” funds as well. Each month, I set a goal for this jar. 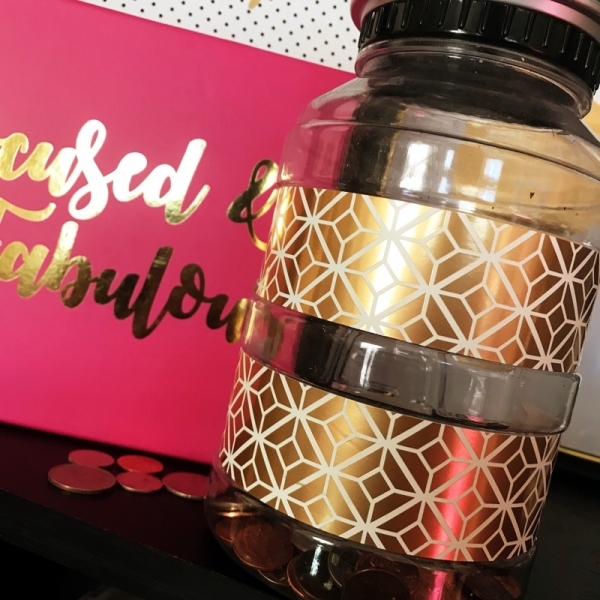 Just to add a little fun to it and to see how much change I can collect within a month’s time to add to the jar and see the amount constantly increase. What on earth could you do with an extra $20, $50, $150? Deposit it in your bank account and DON’T TOUCH IT! There are so many rewards with paying more attention to your coins. I also used my label maker to add a “Goal” sticker to the back and write in a dollar amount that I am reaching for before I cash in. I use a dry erase marker to update my goal. 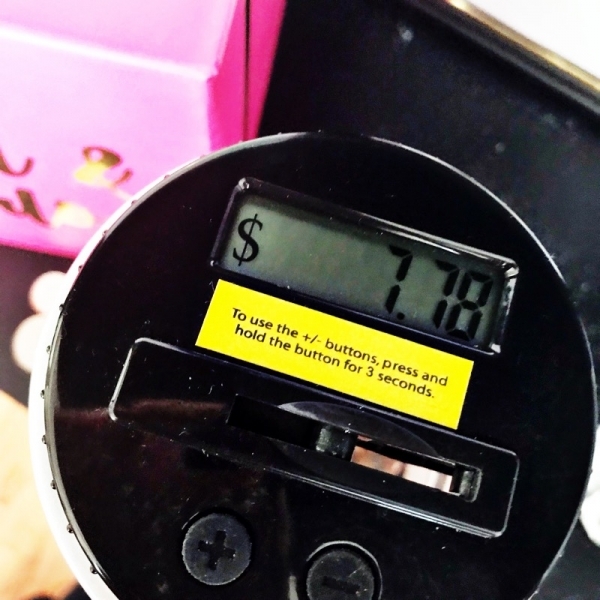 Isn’t this the neatest and simplest tool to help you save a little more this year? Do you have any simple ways you save throughout the year? Let me know down below. Here’s to a fruitful and prosperous 2018, Girlfriends!